Love the colors! The gray, teal and peach are just perfect. Arrived super quick and packaged nicely. Will look great on our new home. Create your dream bedroom look with this Ibiza 5-piece Quilt Set. The medallion print in bright and beautiful colors on the quilt and accessory pieces provides a cozy look you will love. With a burst of colors on one side and a solid reverse on the other, this set gives you two great looks in one. This set is available in queen or king sizes. This set is only $68 for shams, quilt, and 2 throw pillows. The quilt is soft and the colors are true to the picture. No this is not the quilt your grandma handmade...but for $68 bucks, it appears that it will hold up and be durable. Colors and pattern not true to picture. I purchased the black and yellow one . the black looks like an ugly shade of green . The yellow looks more like mustard. The pretty pattern in the picture is hard to see in person. I don't recommend this to anyone! The coloring and pattern is very nice. It is worth the money as it comes with all the decorative pillows and makes a stylish bedroom. I would recommend the item. I ordered the yellow/gray twin "quilt". It says right on the package that it is a duvet cover so I'm not sure why it is advertised as a quilt. It is thinner and intended to put a duvet/comforter into, not a stand alone slightly thicker quilt. Also the yellow isn't really the same as in the picture. I liked the pillows a lot and the design but I am returning since it isn't what I thought I was ordering. I really love the soft yellow and grey tones in this set. It pairs well with beige and silver. I love the light feel of the quilt and have another soft blanket to pull up at night if it gets too cold. This might be acceptable for someone else, but it is not coral. It is peach. straight up peach. not for me. I was looking for coral. Perfect for the summer season! Colors match my (orange shade) room perfectly and the quilt is lightweight and perfect for those possible chilly nights. Got this in the yellow colorway for my stepdaughter, who lives here half the time she's not away at college. It has worked perfectly well, even if it gets the most use from our dog. The level of use it gets is comparable to a guest room so make your decision accordingly. The design is pleasant, the durability is satisfactory, and the pillows are plump. The bedspread is not particularly soft but not many are so, you know, that's expected. So nice, I put grey curtains up and it looks awesome with the bedding. Made well, very soft. I will purchase more of this brand. 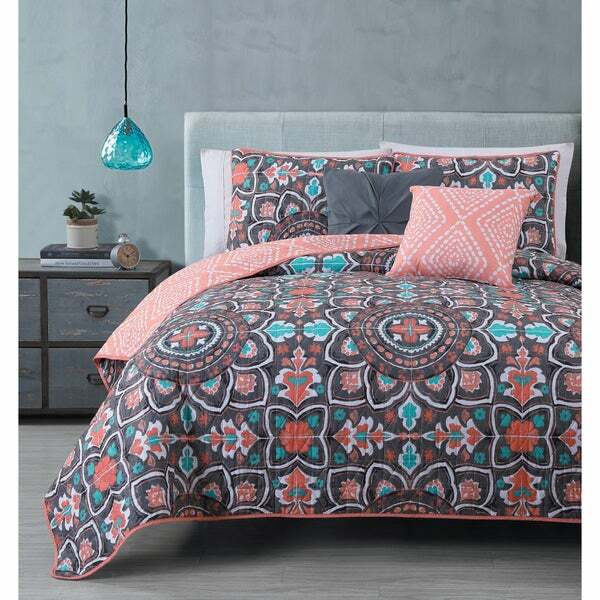 This bedspread is super nice for the price. Good quality materials. Has held up well through many washings. Material is super soft. I would definitely recommend this product. "Looking for a blue and purple king quilt. When will it be in stock again?" "The description is misleading , as it is described as a quilt. I just received mine and it is a duvet cover. Is a quilt available in this pattern or not? I am directing my question to Customer Service, as some people seem to have received a quilt and others a duvet cover." Not knowing which color you ordered, I can tell you the 5 piece bedset I purchased in May, 2016, in blue/purple/torquoise (as a gift for my niece) was a quilt, not a duvet cover, and the colors are beautiful! I hope this answer helps you to resolve your Customer Service issue. "So is this a duvet cover or a quilt?" "How heavy is the material? My duvet is too warm I am looking for something lighter. " It's not heavy at all. Perfect weight for spring and summer. I have the coral one and the colors are beautiful. "Will the grey/coral be available in the future for queen size?" Hello ajohns734, items are restocked as they become available; however, we cannot guarantee an item will be restocked. Thank you for shopping with us. "Can I return this product? How long do I have to return it if it is possible?" Hello lafain.12, items must be returned in new or unused condition with all original packaging to be eligible for a full refund. Our full return policy can be found here: (https://help.overstock.com/app/answers/detail/a_id/1). Thanks for shopping with us! "Is the background color of the coral quilt navy blue or black?" Hello mmw, we appreciate your inquiry. The background color is a dark gray with accents of black. Thank you for shopping with us!